Happy Saturday everyone! Where has the week gone? It went pretty fast, well for me anyways. 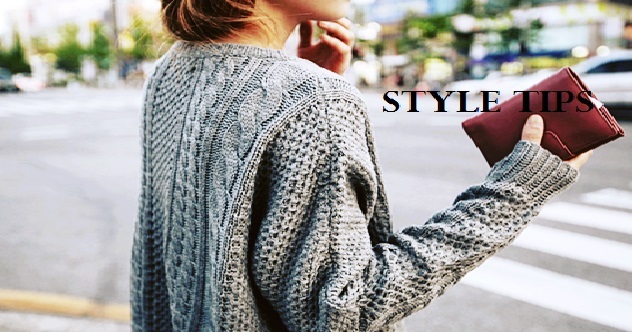 The time is gradually getting colder and colder and one staple I love wearing are knit sweaters. They are versatile and can be dressed up or down. Either way you wear it, you will always stay warm and cozy! Here are some tips on how to style a sweater, if you think you can’t look cute without compromising your warmth. See? Now this is what I am here for. It’s the weekend and you don’t feel like getting all dolled up. What better way to cater to your laziness and chill mood? Get swallowed up in an over-sized sweater perfect for any weekend leisure you have in store. Feel cozy and relaxed while you enjoy a lunch with friends or a movie. Pair this with a relaxed pair of jeans or whatever jeans feel the most comfortable to you with some comfy sneaks such as slips (ugh no shoe tying! Thank goodness) and a nice little chic cross-body bag to polish your look. Remember, coziness and comfort are key. I love a good ol’ preppy look. A nice collared shirt layered with a sweater vest or switch it up with a crop top sweater gives a nice stylish, structured appearance. For an easy-going look, pair this with leggings. Leggings practically goes with anything. Slip your feet into a pair of pumps for that sleek look and a nice over-sized clutch to carry your daily essentials. This is a great transition for work to happy hour. Rock the block in your color block sweater! Create a fun, cool look by pairing it with some overalls, a transitional piece. Color-block sweaters are fun to play with but you also have to be careful on how you style it, while it can go down the tacky road. Try a pair of solid colored booties and a simple dark tonal bucket backpack reflecting that downtown flare. When you are not in a mood for colorfulness, you can never go wrong with going monochromatic. Whether with a solid color or an uniformed print. A turtleneck is great for keeping the neck warm but you still can rock your stylish taste. You always see all black; so let’s go with all white but a with checkered print. Continue the print with a similar skirt in pattern and polish it with white tights to keep those legs warm and white booties. Don’t forget to complete your look with a nice white bag of your choice. These are just some ways to style a sweater for the cool or colder seasons. Go shopping or check your closet and experiment with sweaters you have, then share it with the world! Thank you for reading and enjoy your weekend!